Identification: Distinguishing characteristics and photographs or illustrations appeared in Berg (1949), Muus and Dahlstrom (1978), Wheeler (1978), Phillips and Rix (1985), Ladiges and Vogt (1986), and Smith (1995). Also refer to Page and Burr (1991). Another name used in some of the earlier literature is Idus idus. Native Range: Native from northern Europe through Siberia (Berg 1949; Robins et al. 1991b). Table 1. States with nonindigenous occurrences, the earliest and latest observations in each state, and the tally and names of HUCs with observations†. Names and dates are hyperlinked to their relevant specimen records. The list of references for all nonindigenous occurrences of Leuciscus idus are found here. Means of Introduction: The ide was first imported in 1877 by the U.S. Fish Commission (Baird 1879). It has been stocked intentionally by the U.S. Fish Commission (historically), and by a state agency (recently), and through escapes from commercial and government ponds (Lee et al. 1980 et seq.). In 1889, an estimated 20 ide, along with other foreign cyprinids, escaped into the Potomac River from fish ponds in Washington, D.C., during a flood event (McDonald 1893). Similarly, Schwartz (1963) stated that it may have escaped from commercial ponds at Thurmont, Maryland into the Monocacy River; but he did not provide a date nor other details. Ide were also consigned to applicants in Virginia from 1892 to 1894 (Jenkins and Burkhead 1994). According to Courtenay et al. (1984, 1986), the U.S. Fish Commission gave no specific reason for importing and distributing this species, although they assumed that the intended use was both as an ornamental and food fish. Bean (1903) indicated that this species was introduced into American ponds for ornamental purposes. Schwartz (1963) stated that it may have escaped from commercial ponds at Thurmont, Maryland into the Monocacy River; but he did not provide a date or other details. Reports of ide culture in Arkansas are incongruous. Fletcher and Hallock (1992) reported that Arkansas fish farmers were raising ide for bait in the early 1990s. However, recent discussions with University of Arkansas personnel, fish farmers, and other local experts indicate there are no known records of ide culture in Arkansas and that they are doubtful the the species was ever raised commercially there (N. Stone, Univ. of Ark., pers. comm., 2005). In the early 1980s this species was reportedly being used as a bait fish in Tennessee (Courtenay et al. 1984, 1986). Because this species is sometimes misidentified as goldfish, Courtenay et al. (1984) argued that there was an increased probability of its spread and possible establishment. Status: The ide has been recorded from nine states, but the documentation of its true status in the United States is poor and often contradictory. Courtenay and Stauffer (1990), Courtenay et al. (1991) and Courtenay (1993) listed it as established in Maine; Page and Burr (1991) stated that the species is locally established in a pond in Maine. However, in some early accounts the only known Maine population was thought to have been eradicated (e.g., Courtenay et al. 1984, 1986). In fact, Courtenay et al. (1986) stated that the Maine Department of Inland Fisheries and Wildlife eradicated the population in May 1983. According to Whitworth et al. (1968) one small pond in Connecticut has maintained a population since 1962 or 1963; Schmidt (1986) also listed L. idus as introduced to lowland lacustrine habitat in the Connecticut River drainage. Subsequently, Courtenay et al. (1984, 1986) and Whitworth (1996) stated that the population in Connecticut had been eradicated. It was formerly established in one or a few water bodies in Pennsylvania and New York; however, according to Courtenay et al. (1984, 1986), those populations are no longer extant. The fish that escaped from Washington, D.C. ponds in 1889 apparently persisted for some time. That escape also apparently resulted in the species being listed as occurring in several states along Potomac River, including Virginia and Maryland. Although the literature seems to suggest that the ide population in the Potomac was self sustaining, it is not known when ide actually disappeared completely from the Potomac drainage. For instance, Schwartz (1963) apparently considered the ide to be established in the Potomac River; and Hocutt et al. (1986) listed it as introduced to the Potomac River. However, Musick (1972) doubted that this species still survived there, and both Jenkins and Burkhead (1994) and Starnes et al. (2011) also concluded that there was no evidence indicating the ide persists in the Potomac drainage. Stockings of this species during the late 1800s were unsuccessful in both Nebraska (Morris et al. 1974) and Texas (Howells 1992a). There is only a single record documenting its occurrence in open waters of Tennessee (Saylor, personal communication). Howells (1992a) indicated that the U.S. Bureau of Fisheries (i.e., the U.S. Fish Commission) distributed the species to private individuals for introduction, but the actual introduction sites are largely unrecorded. The species never became established in Texas and has not been reported since their original introduction (Howells 1992a). Impact of Introduction: Unknown. Seeley (1962) recommended against the introduction of the ide into California. Based on his review of the literature, he indicated the species had the potential of becoming established in state rivers, lakes, and reservoirs, and also of entering brackish and estuarine waters. Because of its tolerance to a wide range of conditions, Seeley believed that it had the potential of becoming more of a problem than either goldfish or common carp. Remarks: In its native range, the ide is migratory and found in both freshwater and brackish water habitats (Muus and Dahlstrom 1978). The fish typically prey on larval and adult insects, snails, and other invertebrates; larger individuals also take small fish (Phillips and Rix 1985). The golden orfe or golden ide is a domestic form with portions of the body and fins pinkish-gold or red-orange. This colorful variety has received some degree of attention as an ornamental pond fish since its first introduction into this country near the turn of the century (e.g., Bean 1896, 1903). This specie still is occasionally kept in garden ponds, sometimes in combination with goldfish and koi, or with other orfe varieties, such as the blue orfe (Smith 1995). 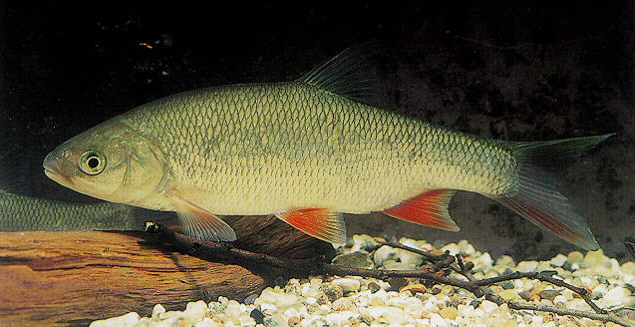 Dill and Cordone (1997) stated that this fish is not known to have been introduced into wild waters of California; however, they also indicated that the domesticated form, the golden orfe, has been present in garden pools and commercial aquaculture facilities in that state for a number of years. Schmidt, R. E. 1986.Zoogeography of the Northern Appalachians. In C.H. Hocutt and E.O. Wiley, eds. The Zoogeography of North American Freshwater Fishes. 137-160.